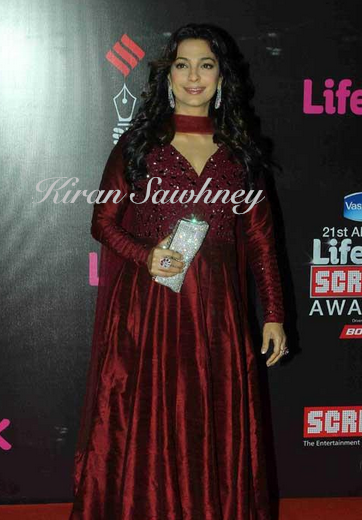 Juhi Chawla played safe and stuck to her favorite designer Manish Malhotra at the Screen awards. She wore deep maroon color long anarkali and teamed it with diamond and ruby rings and earrings from Anmol. She also carried a crystal embellished clutch. Is it just us or others feel it too, that designers like Manish Malhotra, Abu Jani Sandeep Khosla, etc are now a passe. They are creating too loud and tacky outfits which have lots of volumes of clothes (less silhouettes), loud and bold colors, are less impressive and less creative. They are- seen it all, done it all.